Hedge funds - possibly in collusion with Brexit Leave campaign officials - encouraged the release of polls suggesting the Remain side would win even as their own private polls indicated Leave would do so. Remain, 48 percent Leave, so it’s still close and it’s still too early to know definitely—but, based on the figures that we’re seeing, based on the trends that have occurred, and based on historical precedent—we think that Remain are in the strongest position.” As in past elections, Twyman added, voters had embraced the status quo on Election Day. London or at trading desks in Chicago, people watching Sky or reading headlines sparked by its coverage had every reason to think Remain would prevail. But not quite everyone. named because of confidentiality agreements. Pollsters said they believed Brexit yielded one of the most profitable single days in the history of their industry. Some hedge funds that hired them cleared in the hundreds of millions of dollars, while their industry on the whole was battered by the chaos Brexit wrought in global financial markets. Although confidentiality agreements have made it difficult to discover the identities of many of the hedge funds that bought exclusive or syndicated exit polls, at least a dozen were involved, and potentially many more, Bloomberg found. Survation’s results before making at least one of two public concessions that night, meaning there was a good chance he was feeding specious sentiment into markets. YouGov polls in the British press set off a national panic ahead of the vote. YouGov had nationalists closing the gap, and then, days later, jumping ahead with fewer than two weeks left in the campaign. 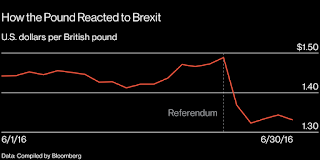 Nervous investors sent the British pound and bank stocks down sharply. Shocked government leaders responded, just days before the vote, by promising a greater devolution of powers to the Scottish people if they stayed in the U.K., a pledge known as “The Vow.” Critics would later charge that misleading YouGov data, which proved fantastically off the vote, had shaped the future of an entire country. markets, the survey’s accuracy was meaningless; traders simply needed to know the results before they became public. They offered YouGov several multiples more than the newspapers had paid to commission the polls in the first place, the two insiders recalled. YouGov rejected these offers, the insiders said. Survation, along with at least one other pollster, saw other opportunities. In 2015, the Conservatives, under David Cameron, swept to dominance in the U.K.’s general election. Cameron had promised to hold a referendum on the nation's membership in the European Union if he won. 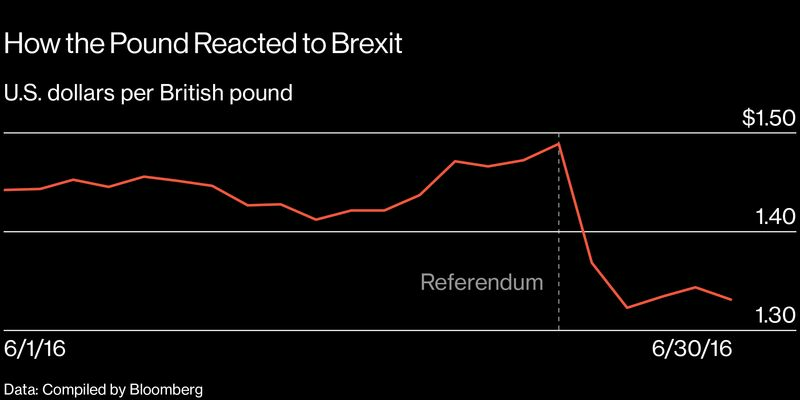 Hedge funds realized immediately that if the Scottish campaign had moved markets, a referendum on the U.K.’s membership in the world’s largest trading bloc might shake them to their very core. YouGov started getting hedge fund calls right away, according to sources familiar with the matter. So did the other polling companies. 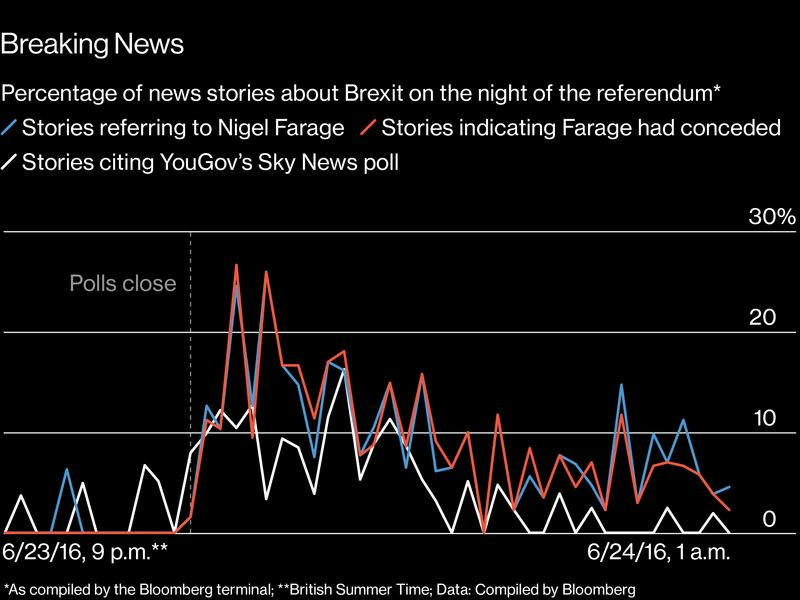 Buying a trading advantage through private exit polls on the day of the referendum was a primary interest, according to executives across the polling industry. But public-opinion-driven swings in the market during the campaign also could offer lucrative trading opportunities. But there were two potential obstacles to hedge fund exit polls. For starters, U.K. broadcasters normally air the results of their own exit poll at 10 p.m., immediately after voting closes. If this happened for Brexit, it might negate some of the advantages hedge funds had from private polls by giving the world definitive information at 10 p.m., according to polling firm executives. That's because the official exit poll—jointly funded by the BBC, Sky and ITV, and based on 20,000 face-to-face interviews—is the authoritative projection of the day's voting. It correctly predicted the last four U.K. general elections. The face of the broadcasters’ election-night exit poll, its chief designer and interpreter, is a 64-year-old Scottish professor named John Curtice. He enjoys a rare level of trust across party lines and a cult following among political junkies. After the government set a referendum date, the academic spoke with broadcasters and they decided the usual exit poll was not feasible, recalled Sam Woodhouse, a BBC editor involved. They had made the same call for Scotland. Curtice would later tell BBC viewers that his predictive models relied on a comparable vote, and for Brexit there was none, making a credible exit poll an expensive and difficult proposition. However, hedge funds were spending the money to line up their own private polls—and Curtice was involved. He told Bloomberg that polling company ICM paid him for his work on behalf of a hedge fund called Rokos Capital Management. Curtice said he participated “in a couple of phone calls with Rokos, where the design of the polling itself was discussed, alongside the modeling I was doing.” He said he also had discussions solely with ICM. The company conducted an exit poll for Rokos, according to Curtice and another knowledgeable source. Curtice said he didn’t help conduct the poll on the day, nor did he help analyze the results. He said his primary role was to help ICM build a model that enabled the hedge fund to predict the likely outcome of the vote as localities began reporting results. Rokos could then calibrate its trading strategy off a mixture of polling data and results as they started coming in after midnight. Alan Kilkenny, a Rokos spokesman, declined to comment. Curtice also is president of the British Polling Council, a voluntary, self-regulating body that counts YouGov, Survation, ICM and the nation’s other major pollsters among its members. The lack of a formal exit poll for broadcasters made it possible for the group’s members to earn record revenues from Brexit, some polling company executives said. "The claim sounds plausible," Curtice said, "but I am not in a position to verify it one way or the other." He also said he was not aware of specifics about other hedge fund polls, or their results, including ICM's. the public” but that multiple hedge funds getting the same exit poll might cross the line. Other polling companies appear to have interpreted the law differently. In the runup to the referendum, YouGov also sold regular online polls to hedge funds, according to clients and others involved. The data effectively provided hedge funds with an early indication of what YouGov would publish later, according to one source familiar with the matter. Shakespeare said that this was never his company's business strategy. He also said all of “our data predicted the same result. There was never any difference between what our clients knew and what the public knew.” Sky declined to comment. On June 23, the day of the EU referendum, Farage and his team gathered at the London home of a UKIP adviser. Their actions that day have been retold in two books. The Bad Boys of Brexit is an insider account penned by Arron Banks, a main financier of Farage's unofficial Leave campaign who was with the UKIP leader that day. The second account is contained in All Out War: The Full Story of How Brexit Sank Britain’s Political Class, by journalist Tim Shipman. It is based on an interview with Chris Bruni-Lowe, who was Farage’s chief political adviser and was with Farage and Banks on June 23. Farage made the second concession in an interview with the Press Association, a U.K. news cooperative. Its report says: “Mr. Farage told the Press Association: ‘I don't know, but I think Remain will edge it, yes. The massive increase in voter registration will be the reason for that.’ Asked if he was just experiencing election-night jitters, the UKIP leader replied: ‘It is a calm and rational feeling. If I am wrong, I would be thrilled. But it is what we have seen out and about, and what I know from some of my friends in the financial markets who have done some big polling.’” Bloomberg sent a series of headlines from that interview to its more than 300,000 financial clients around the world. Inside its hedge fund client’s office, YouGov had three pollsters working through the night. They spoke directly with the hedge fund’s analysts, according to an inside account confirmed by Shakespeare. The analysts would duck in and out of the room, asking YouGov's team to quantify, from zero to 100, how confident they were in their latest predictions, according to a source familiar with these events. slight edge—they don't expect you to be 100 percent accurate,” said one pollster. At least six other hedge funds were among those negotiating or shopping for polls, according to interviews with polling executives, including one who accessed his email archives for Bloomberg during an interview. These included Arrowgrass Capital Partners, Element Capital, Maven, PointState and TSE Capital Management. The same polling executive said that at least three more—North Asset Management, SPX Capital and Vigilant—were trying to obtain information regarding the timing of media-published polls. It's not clear which, if any, bought polling. All of these firms declined to comment or did not respond to requests for comment. Even if that doesn’t happen, Prime Minister May’s government remains seized by internal divides over Brexit, leading to predictions of a new snap election. A pollster who profited off the EU referendum said, “That would be something that would have the potential to move the markets around” again, because a snap election would really be about implementing Brexit.Asked for his prediction, the pollster demurred. He said he will keep his opinions to himself until hedge funds come calling again.